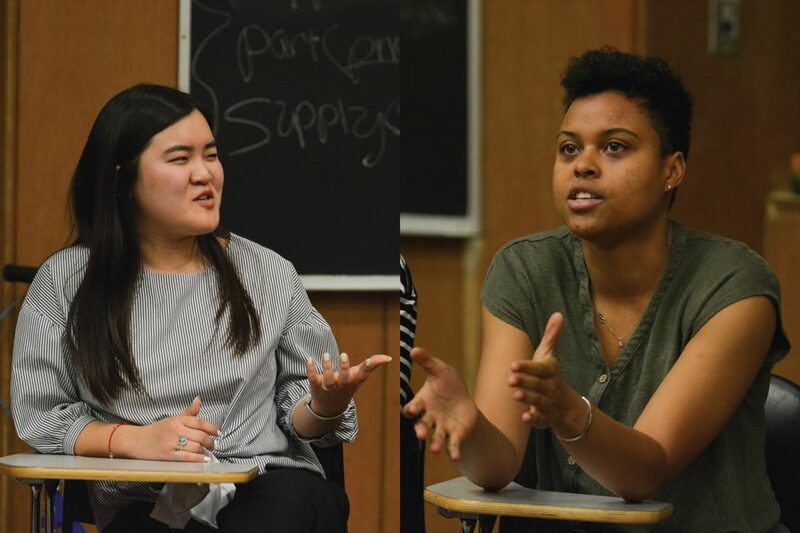 ASG presidential candidates Justine Kim (left) and Sky Patterson (right) discuss policy during Tuesday’s debate. In Thursday’s debate, the two addressed how to help marginalized communities on campus and sexual assault survivors. During their second and final debate on Thursday, candidates for Associated Student Government president and executive vice president discussed support for marginalized communities, including ensuring they have safe spaces. The half hour-long debate, attended by about 20 people in Technological Institute, was originally supposed to be hosted by the Coalition of Colors, but after a last-minute change, ASG moderated the debate instead. Of the five questions moderators posed, two asked about candidates’ policies to provide marginalized students with resources, support and safe spaces. SESP junior Justine Kim and her running mate, SESP sophomore Austin Gardner, said they hope to address the different intersections of student identities, both inside and outside of ASG. Specifically, they said they hope to better communicate with and understand organizations on campus to allocate money more holistically. For example, Gardner said, many student groups have lost the funding they need to attend conferences. “We want to advocate for bringing back their funding to alleviate the barricades made to access, financially,” Gardner said. Their opponents, Weinberg juniors Sky Patterson and Emily Ash, highlighted their campaign’s uniqueness in addressing LGBTQ issues on campus and their desire to “show, not tell” policies by omitting using buzzwords throughout their platform. Patterson proposed ensuring safe social spaces for marginalized groups on campus, and discussed how, despite “checking a lot of the boxes,” she will not pretend to understand the experiences of all of those communities. “We have been talking with a lot of people on campus, which helps,” Patterson said. “If we start by benefiting marginalized students first, then everyone will benefit eventually. Regarding safe spaces, Kim said she knows accessibility within the new student center is something ASG is “staunchly advocating” for and she said she stands behind this. Kim also said she recognizes that the constant fight for space is an issue both for student groups and academic programs. The candidates also discussed their plans to progress on sexual assault issues at NU and what reforms they hope to make within ASG. Kim and Gardner proposed making ASG more of a sexual assault survivor-centered organization that helps train student organizations in how to address informal accusations. More generally, they plan to reform ASG’s analytics survey to better serve organizations and their needs. Patterson and Ash said they would provide more funding to the Center for Awareness, Response and Education and more support for survivors. To reform ASG’s internal process, the candidates said they would continue to overhaul funding and appoint an officer to oversee those changes — someone who is aware of and in line with their platform’s values. Overall, the two said they want to better the student experience because they know firsthand the hardships of trying to access adequate NU resources.